Rory McIlroy feels as excited as a kid on Christmas morning every time he drives down Magnolia Lane. But this year the Holywood star is hoping that his special, laid-back preparations for the Masters will see Santa Claus turn up early and leave a green jacket under the tree. Determined to wipe away the bad memories of last year’s missed cut by grabbing his first major in just his third Masters appearance on Sunday, McIlroy reckons he’s better prepared than ever before. He said: “I was flying up here for some practice last Thursday and it was the same feeling you get on Christmas morning. You can’t sleep. You are up at five, you are up at six. It’s a very special place for any golfer. The last man to register yesterday, McIlroy joked: “They gave me No 99. That’s fine, so long as I don’t shoot it! “I am feeling good. I had 10 really good days of practice in Florida and I came here and got a good couple of days work done last Thursday and Friday. “I am feeling pretty good. I feel like I have done most of my preparation. I have mapped the greens, I have done everything. McIlroy’s upbeat mood was a major contrast to 12 months ago when he missed the cut for the first time in a major, complained of a bad back and confessed that the game was getting him down. But he learned a major lesson that week and has since changed the way he approaches the majors. He’s now decided that playing less golf keeps him fresh and raring to go when he turns up for the big events. And while the Masters will be just his sixth start of the season, he reckons he’s got the game to challenge for his first major win. Reflecting his change of mood over the last year, he said: “I feel so much better about my whole season and my game. “Coming in here last year I had just missed the cut at Houston, my back wasn’t feeling too good and I wasn’t in a great place. “This year I feel like I have paced myself well. I have only played five tournaments and had a chance to win a couple. McIlroy spent two weeks playing golf at home with his pals after last year’s Masters disaster and came back out to finish third in The Open and the US PGA. And he’s decided to repeat that tactic this year by playing fun golf with pal Harry Diamond, Ryder Cup team mate Luke Donald and American big-hitter Dustin Johnson. Confessing that he has geared all his early season preparation into making a run at Augusta, McIlroy said: “It’s just a great feeling to be back. Every time you get your invitation in the post, from the start of the season you are trying to get your game ready for this tournament. “I said from 7 January to 7 April all I am doing is trying to get my game in shape for here. Red-hot Rory McIlroy birdied six of the last 10 holes to finish his Masters debut on a massive high. Rory McIlroy’s Masters disaster began with a triple bogey on the 10th at Augusta Rory McIlroy believes his final round meltdown at the Masters will help him become a major winner. No doubt McIlroy took a close look at the trees and cabins left of the 10th fairway on his return trip to Augusta National. Pictured earlier this season by Stuart Adams, www.golftourimages.comWorld No 2 Rory McIlroy continued his low key preparations for the Masters Tournament with a hush-hush visit to Augusta National on Wednesday. The 22-year old, who led the tournament by four shots entering last year’s final round only to collapse to a nightmare 80, played a quiet 18 holes and was accompanied on his journey by his caddie JP Fitzgerald. Rory McIlroy has been impressive on the greens so far this week. Photo Eoin Clarke/www.golffile.ieRory McIlroy became the jolly green giant at Augusta after a brilliant second round putting display kept his quest for Masters revenge right on track. 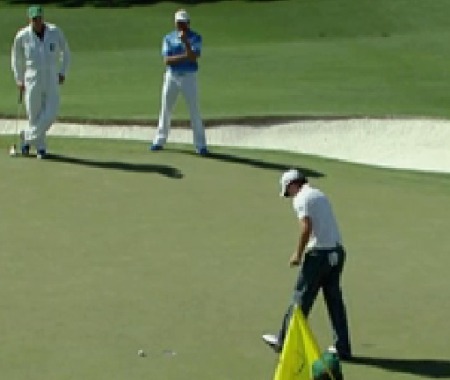 Three putts from four feet at the seventh spelt the end for Rory McIlroy on Saturday. Rory McIlroy kissed the Masters goodbye when he had bad day off the tee and an even worse day on the greens to slip 10 shots behind shock leader Peter Hanson at a sun-kissed Augusta National. The world No 2 three-putted three times en route to a 77 that left him hugging playing partner Sergio Garcia (75) and talking about yet another nightmare nine-hole run instead of a glorious title charge.